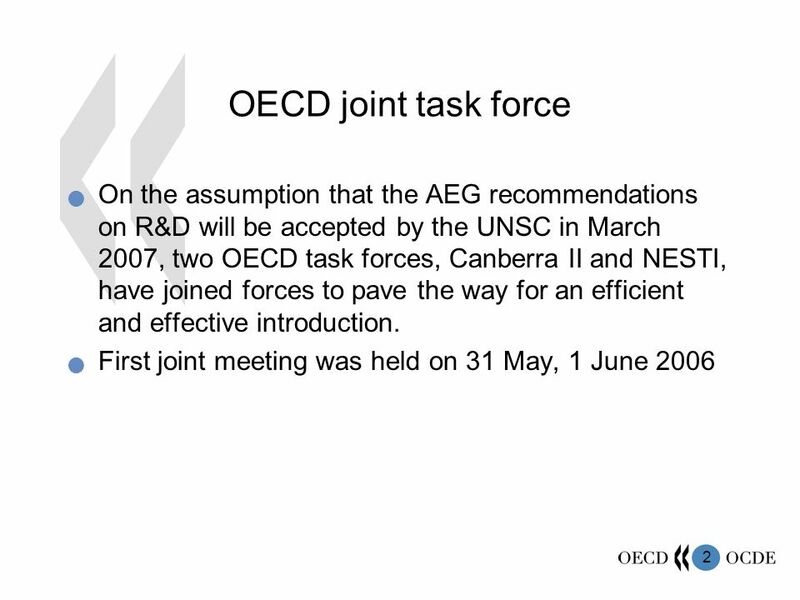 1 Capitalisation of R&D Report of R&D Task Force Charles Aspden Working Party on National Accounts, October 2006. 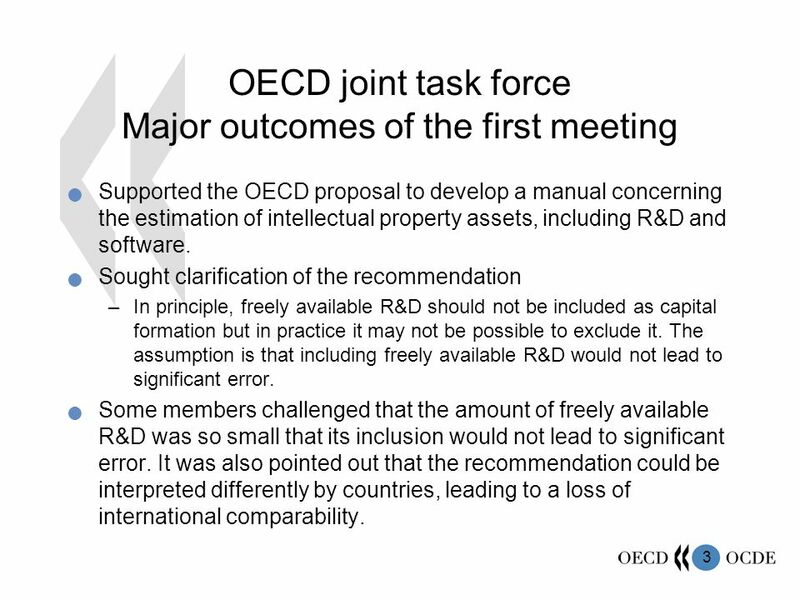 3 3 OECD joint task force Major outcomes of the first meeting Supported the OECD proposal to develop a manual concerning the estimation of intellectual property assets, including R&D and software. Sought clarification of the recommendation –In principle, freely available R&D should not be included as capital formation but in practice it may not be possible to exclude it. The assumption is that including freely available R&D would not lead to significant error. Some members challenged that the amount of freely available R&D was so small that its inclusion would not lead to significant error. It was also pointed out that the recommendation could be interpreted differently by countries, leading to a loss of international comparability. 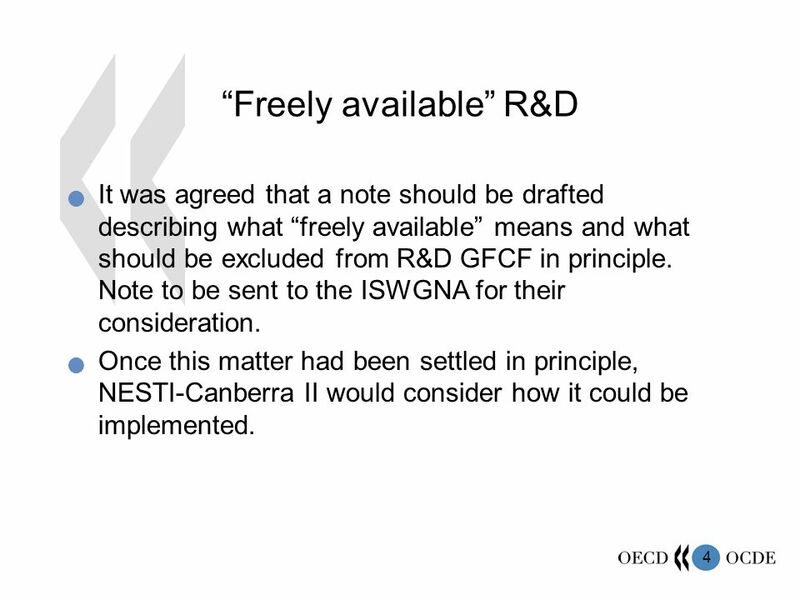 4 4 Freely available R&D It was agreed that a note should be drafted describing what freely available means and what should be excluded from R&D GFCF in principle. Note to be sent to the ISWGNA for their consideration. Once this matter had been settled in principle, NESTI-Canberra II would consider how it could be implemented. 5 5 Freely available R&D Attachment 3 to the paper describes in principle what the ISWGNA thinks should be included in GFCF and what should be excluded. –R&D output that when made freely available leaves the owner (or the members of its collective group) with no economic benefits should be excluded from GFCF. –However, making R&D output freely available does not exclude the original knowledge from being an asset provided the expected benefits for the economic owner (or the members of its collective group) are not diminished. What matters is the effective management and control of the knowledge asset in order to ensure the expected benefits are obtained. 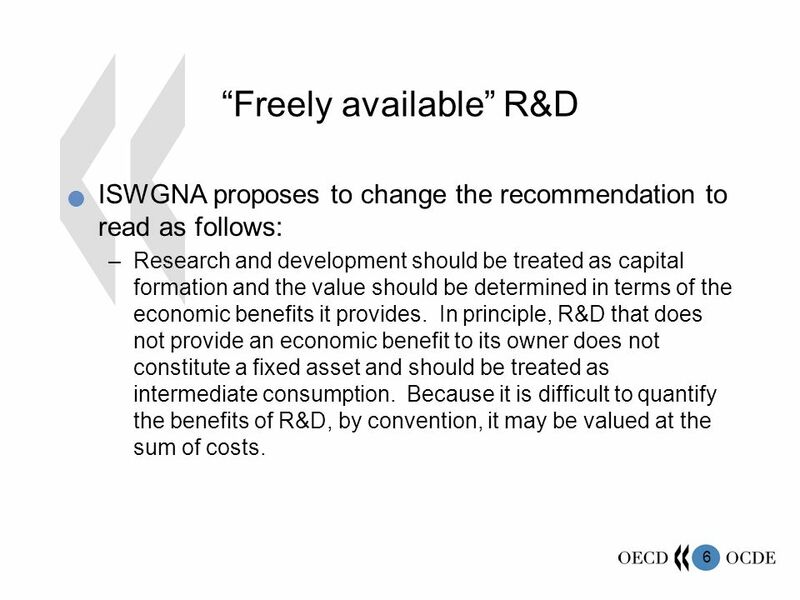 6 6 Freely available R&D ISWGNA proposes to change the recommendation to read as follows: –Research and development should be treated as capital formation and the value should be determined in terms of the economic benefits it provides. In principle, R&D that does not provide an economic benefit to its owner does not constitute a fixed asset and should be treated as intermediate consumption. Because it is difficult to quantify the benefits of R&D, by convention, it may be valued at the sum of costs. 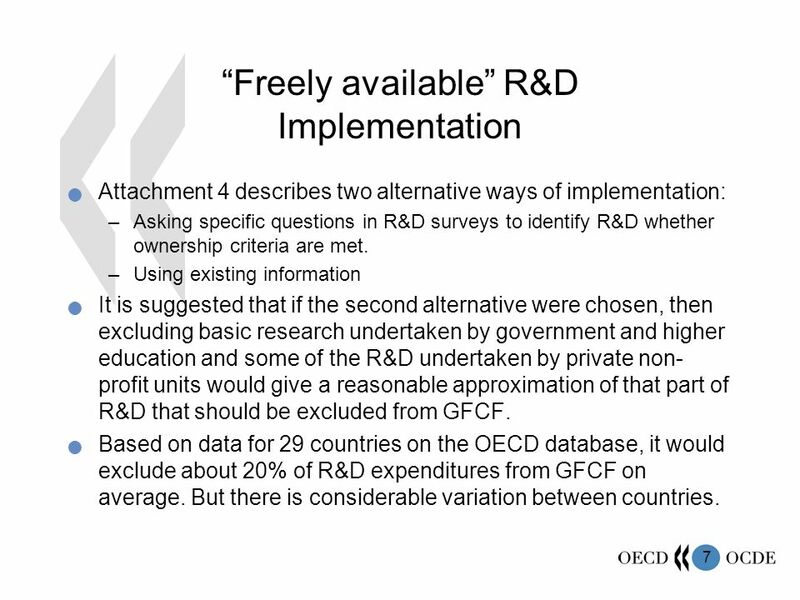 7 7 Freely available R&D Implementation Attachment 4 describes two alternative ways of implementation: –Asking specific questions in R&D surveys to identify R&D whether ownership criteria are met. –Using existing information It is suggested that if the second alternative were chosen, then excluding basic research undertaken by government and higher education and some of the R&D undertaken by private non- profit units would give a reasonable approximation of that part of R&D that should be excluded from GFCF. 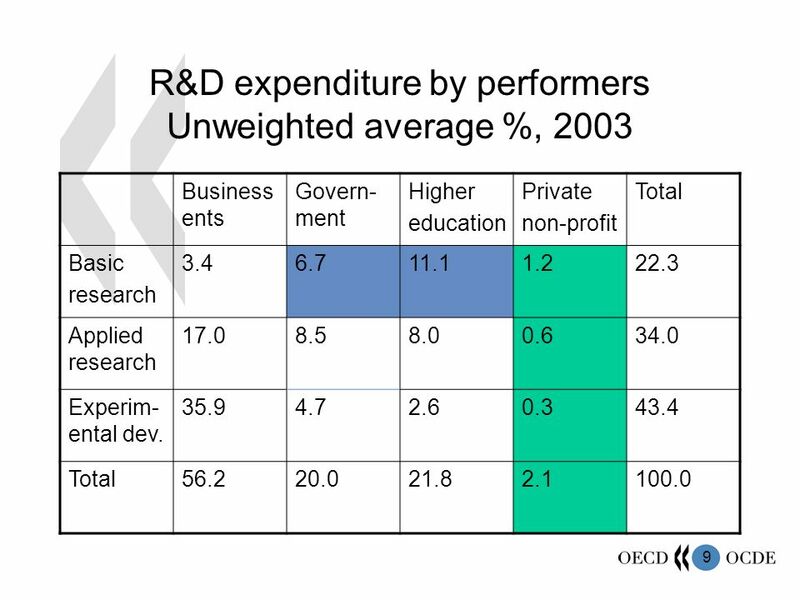 Based on data for 29 countries on the OECD database, it would exclude about 20% of R&D expenditures from GFCF on average. But there is considerable variation between countries. 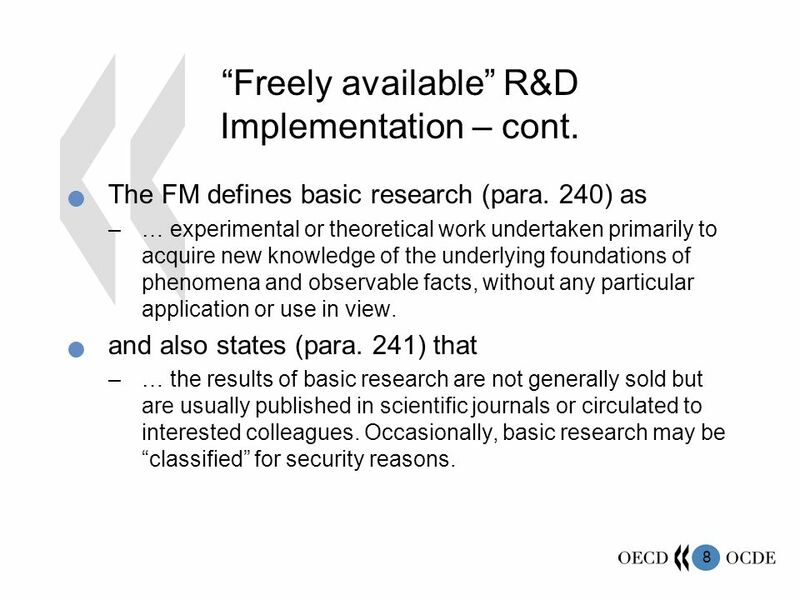 8 8 Freely available R&D Implementation – cont. The FM defines basic research (para. 240) as –… experimental or theoretical work undertaken primarily to acquire new knowledge of the underlying foundations of phenomena and observable facts, without any particular application or use in view. and also states (para. 241) that –… the results of basic research are not generally sold but are usually published in scientific journals or circulated to interested colleagues. Occasionally, basic research may be classified for security reasons. 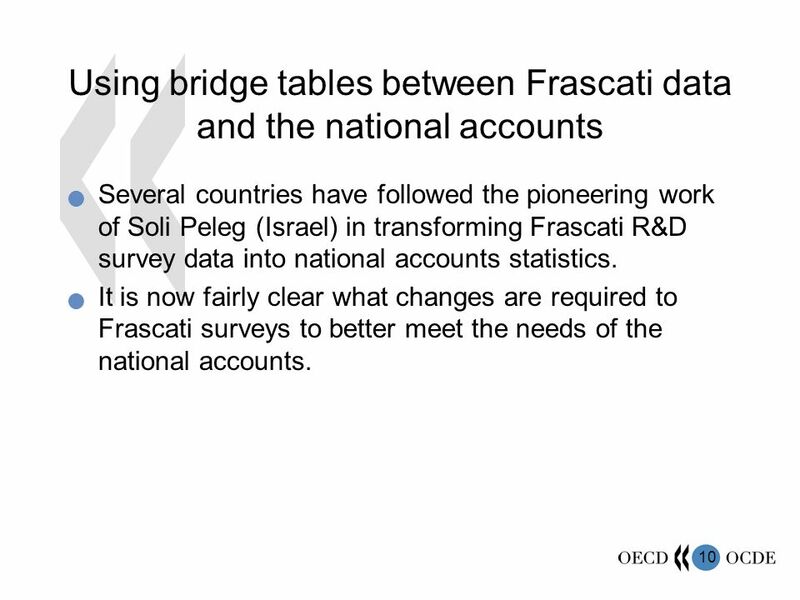 10 10 Using bridge tables between Frascati data and the national accounts Several countries have followed the pioneering work of Soli Peleg (Israel) in transforming Frascati R&D survey data into national accounts statistics. It is now fairly clear what changes are required to Frascati surveys to better meet the needs of the national accounts. 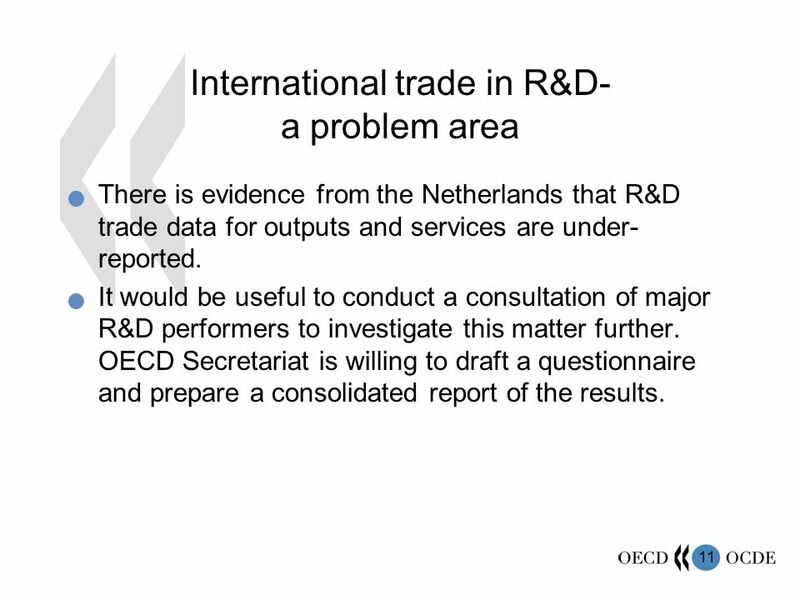 11 11 International trade in R&D- a problem area There is evidence from the Netherlands that R&D trade data for outputs and services are under- reported. It would be useful to conduct a consultation of major R&D performers to investigate this matter further. OECD Secretariat is willing to draft a questionnaire and prepare a consolidated report of the results. 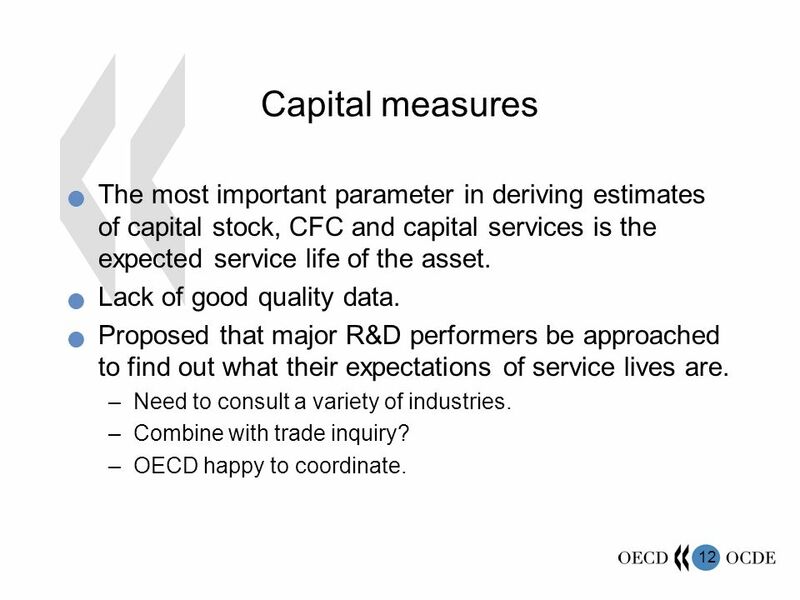 12 12 Capital measures The most important parameter in deriving estimates of capital stock, CFC and capital services is the expected service life of the asset. Lack of good quality data. Proposed that major R&D performers be approached to find out what their expectations of service lives are. –Need to consult a variety of industries. –Combine with trade inquiry? –OECD happy to coordinate. 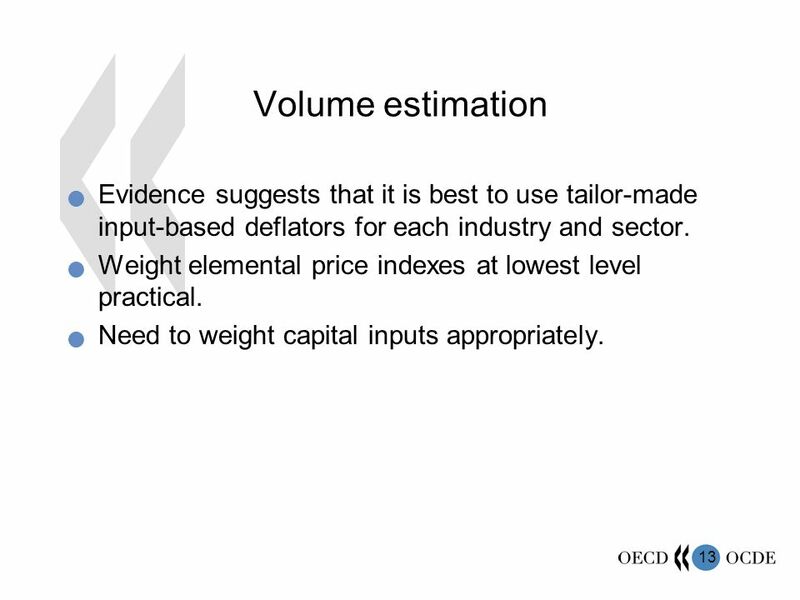 13 13 Volume estimation Evidence suggests that it is best to use tailor-made input-based deflators for each industry and sector. Weight elemental price indexes at lowest level practical. Need to weight capital inputs appropriately. 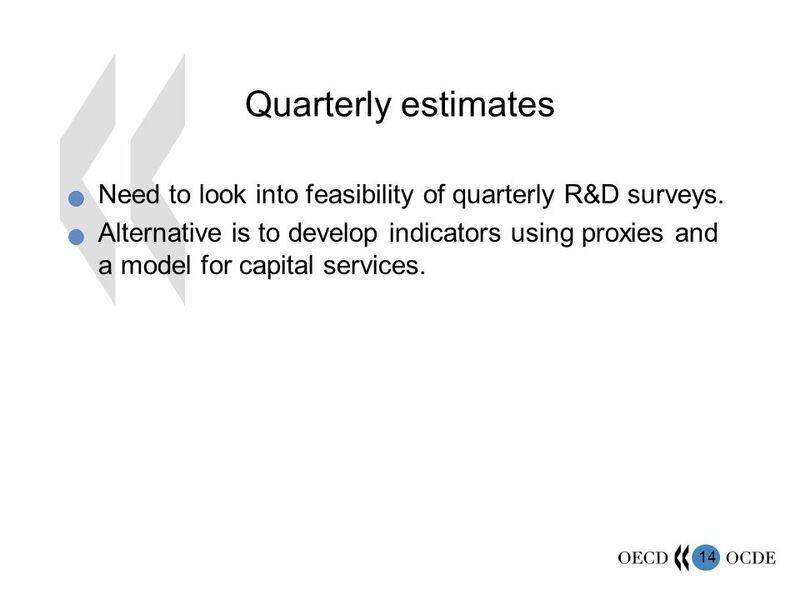 14 14 Quarterly estimates Need to look into feasibility of quarterly R&D surveys. Alternative is to develop indicators using proxies and a model for capital services. 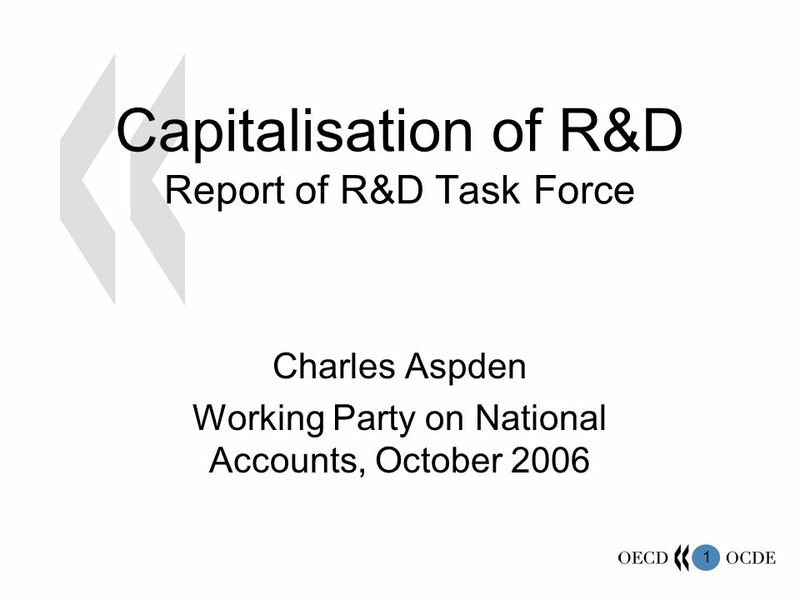 Download ppt "1 Capitalisation of R&D Report of R&D Task Force Charles Aspden Working Party on National Accounts, October 2006." KLEMS, the ESA, and Eurostat Jukka Jalava Unit C2: National accounts – Production Eurostat/European Commission. 2008 SNA CURRENT SITUATION Presentation to the 12 th OECD-NBS Workshop on National Accounts October 2008. 1 Progress report on Expert Groups on micro and macro household statistics WPNA meeting October 2011 Maryse FESSEAU (OECD – Statistic Directorate, National. 1 « June, 6 and 7, 2007 Paris « Satellite Account for Education for Portugal: Implementation process and links with the National Accounts and Questionnaire. ESTAT/C/1 08/02/ :37 Slide: 1 Commission Européenne - Eurostat Revision of ESA 95 Planning and Process OECD Working Party on National Accounts October. STD/PASS/TAGS – Trade and Globalisation Statistics STD/SES/TAGS – Trade and Globalisation Statistics Globalisation cube on OECD.Stat Pulling it all together. 1 1 Balancing supply-use tables Ann Lisbet Brathaug Steinar Todsen Statistics Norway OECD WP NA October 2006. 1 Paris 6-7 June nd workshop Measuring Education and Health volume output François LEQUILLER, OECD/STD/NAFS Measuring Education and Health volume. The BEA-NSF R&D Satellite Accounts, 2007 Results and Current Challenges Carol E. Moylan Bureau of Economic Analysis OECD Working Party on National Accounts. Regional Seminar on Developing a Programme for the Implementation of the 2008 SNA and Supporting Statistics January 30-February 1, 2013 Kingston, Jamaica. 1 Goods for processing Training Workshop on 2008 SNA for ECO Member States October 2012, Tehran, Islamic Republic of Iran GULAB SINGH United Nations. 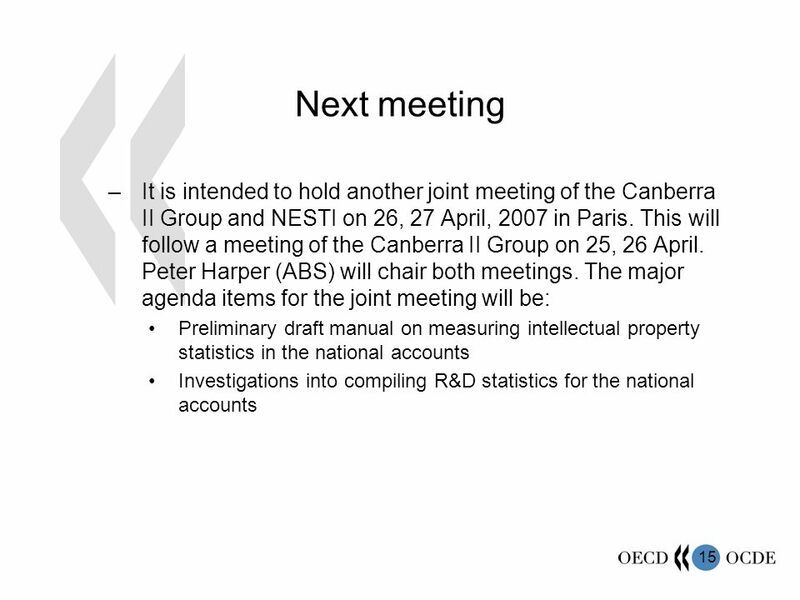 Implementation of the 2008 SNA in the OECD Charles Aspden Working Party on National Accounts, October 2008.